I’m guessing everyone could use a little comfort right around now. Amiright? 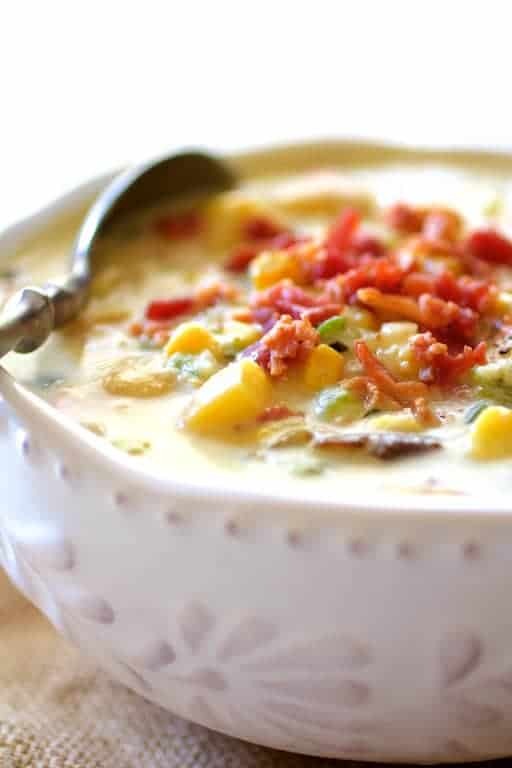 This creamy chowder with intensely flavored Poblano peppers, sweet corn, buttery Yukon gold potatoes, smoky bacon and a Gouda cheese needs to be your prime candidate for comfort food this fall and winter! We planted only one Poblano pepper plant this year and that little plant put out a crazy amount of fruit! They weren’t very large but they sure had some heat. In fact, I was unprepared for the amount of heat when, after peeling some roasted Poblanos, I inadvertently rubbed my eye. Yow. So be warned….. When working with any chile pepper, wear gloves! 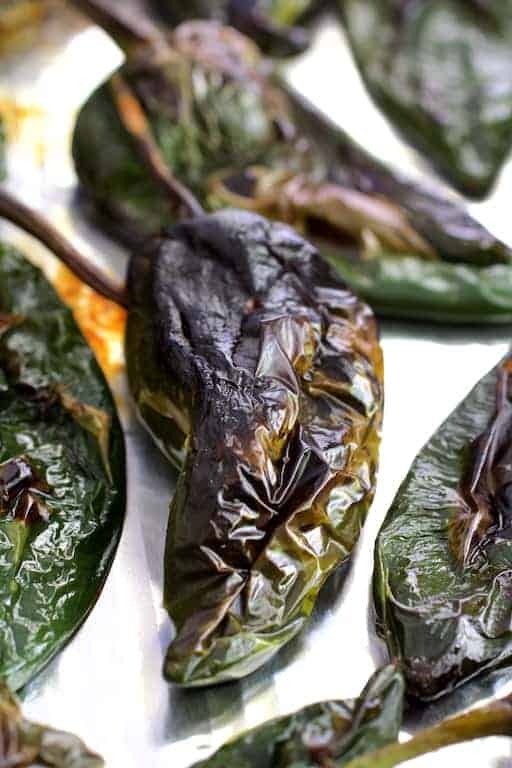 To roast Poblanos, place them on a rimmed baking sheet. Preheat the broiler to high, set a rack near the top–approximately eight inches away from the element works well. Broil until the top is blackened, approximately 8-10 minutes. Turn them over and blacken the other side–approximately 5-6 minutes. Immediately cover with aluminum foil or another rimmed baking so they steam. The steam is going to separate the skin from the flesh, making them easier to peel. That’s some serious flavor you just coaxed out of those peppers! Peel and remove as many seeds as possible. Resist the temptation to peel them under running water as you will rinse away flavor. If you’re in a hurry, you can get away with not roasting the peppers. Simply add them when cooking the onions and cook until soft. I like to use waxy potatoes such as Yukon gold in soups because they don’t get crumbly after being cooked. Starchy Russets tend to crumble and can get “whittled” away in soups and stews. It’s a little late in the year for good fresh corn, but frozen corn kernels work perfectly. Although this soup looks like I used a ridiculous amount of cream, there’s only 1 cup in the entire pot. If you want to go lighter, half-and-half works well, too. Equipment used: (Affiliate links.) 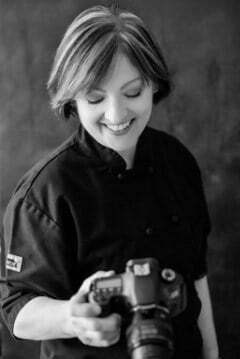 Thank you for supporting From A Chef’s Kitchen! Cook the bacon in a Dutch oven over medium heat until crispy. Transfer to a paper towel-lined plate. Crumble when cool. Wipe out the Dutch oven. Heat oil and butter over medium-high heat in the Dutch oven. Add the onion, reduce heat to medium-low and cook 7-8 minutes or until softened. Stir in the garlic and cook briefly, approximately 15 seconds. Add the flour and cook 2 minutes. Add the chicken broth and potatoes and bring to a boil. Reduce heat to medium and cook until the potatoes are tender. 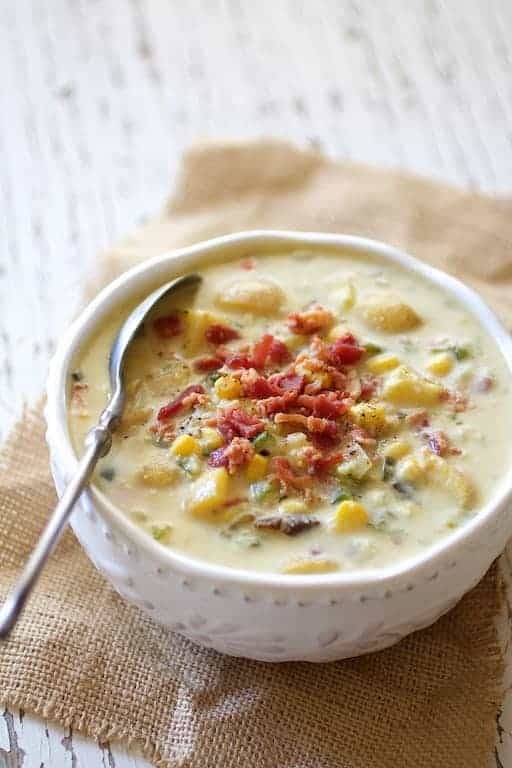 Add the roasted and peeled peppers, corn and heavy cream and bring back to a simmer. Add Gouda cheese and stir until cheese has melted. Add half the bacon, reserving the remainder for garnishing the chowder. Season to taste with salt and black pepper to taste. Serve in bowls, garnished with crumbled bacon. Prep time does not include roasting the peppers. If roasting the peppers, add 45 minutes: 15 minutes to roast and 30 minutes to cool and peel. 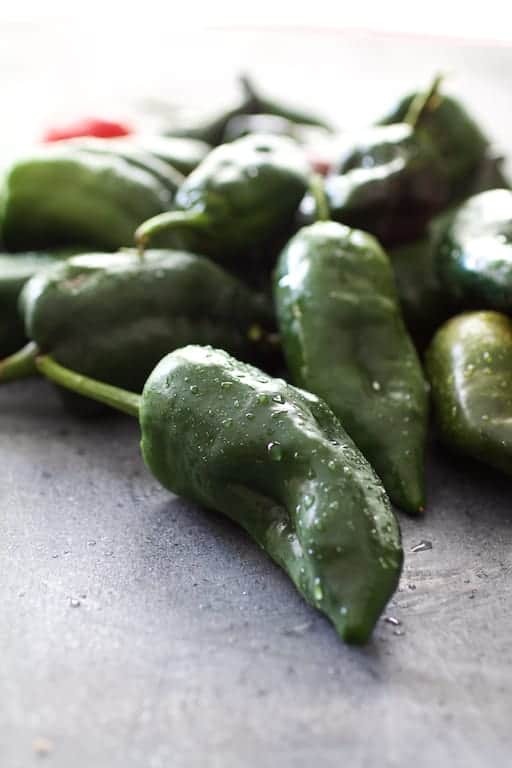 Poblano are our go to pepper for any recipe. This is fabulous! I added 1 tsp. Of cumin, 1/2 tsp of oregano and a couple of bay leaves to the seasoning mix. For those who need protein like my family. I roasted 4 chicken thighs, shredded them and added prior to serving. Garnished with a lime wedge, served hot rolls and a nice green salad. Wonderful aroma, excellent taste. A keeper for sure! Loved the smoked gouda! Thanks, Cindy! Adding chicken to this soup is a GREAT idea! So glad you enjoyed and please stay in touch! Any suggestions on making ahead of time? I want to make this for a work party and reheat in the crock pot. Thank you. Hi, Leandra, Thanks for your question. It will reheat beautifully in a slow-cooker. Because of the potatoes and cheese, low and slow is the best way to go! Made this tonight, so so easy & yummy ! a keeper for sure. Thank you, Linda! I so appreciate hearing that! So glad you enjoyed and please stay in touch. Oh my goodness…yum!! This looks so amazing! I cant wait to make this recipe!! Thanks for sharing and your photos are beautiful! Thanks, Amanda! Hope you enjoy! These photos have me drooling! I love hearty stews this time of year. Can’t wait to make this. What a lovely recipe! I really love poblano, so you intrigued me to cook it! Thanks, Krystallia! Such a beautiful name! 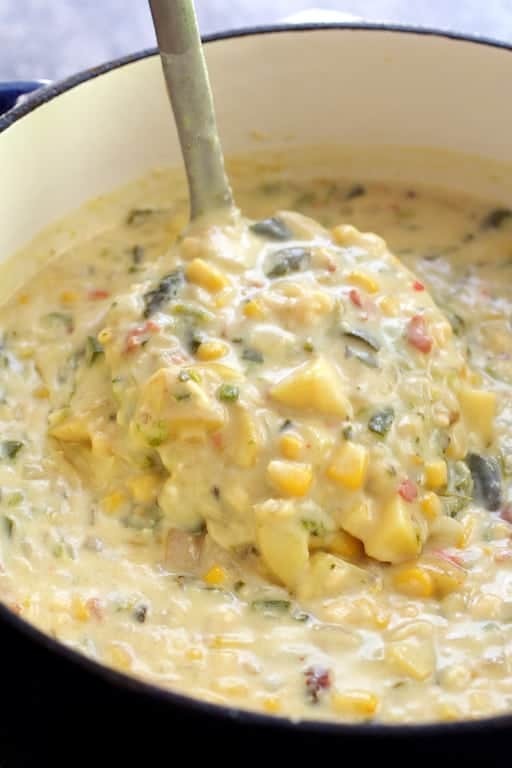 This chowder looks like our kind of comfort food. My husband and I we are both fighting a cold, so that would be perfect! Love the roasted poblano peppers, I don’t work with them often, I need to! Beautiful pictures, too, Carol! I LOVE spicy food when I’m fighting a cold or have come down with one. Feel better soon, Nicoletta! Thanks, Kimberly! We’ve had a bumper crop of poblanos, so stay tuned for more recipes!